Bonsai Blast is a game of marble blasting bliss. It comprises of 90 increasingly challenging levels. Each is having its hardness. All are designed to test and improve the skill of the gamer. 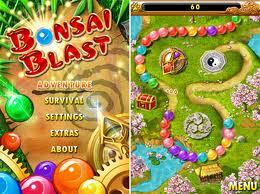 The only ultimate goal of Bonsai Blast is to entertain the player without any frustration and repetition. Every time the player starts the game, it seems to be engaging with a different graphics and playing mode, which also suits to all the levels. Though the game has the resemblance of other game, it is unique with individuality. As already mentioned, it’s a marble blasting game involving shooting marbles of same color more than at least two. There is a trigger to fire the marbles and points awarded for firing the group of marbles. When the level rises one by one the gamer gets a gift in form of treasures and bonus points. Also, the game has the advantage that it allows the player to change the location of the shooter or trigger. Yes! It’s completely up to the choice and wish of the player to change whenever needed. Every level delivers with a beautiful “Zen garden” theme along with touch screen control. Glu’s game is available at all reasonable rates starting from $1. Also, the scheme of power-ups helps to get through the higher levels. Simply saying – Bonsai Blast is a game for the fans of Tetris, Wordles, Trism, Puzzloop, and Zuma It has received the IGN SILVER AWARD.